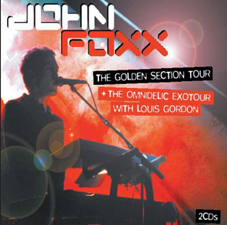 Released in 2003, The Golden Section Tour/The Omnidelic Exotour brings together Foxx and Gordon's Subterranean Omnidelic Exotour and a previously unreleased live recording from John Foxx's Golden Section tour of 1983. The Golden Section Tour recording from 1983 mainly comprises tracks from The Golden Section and The Garden, as well as some of John's best-known Ultravox songs, such as "Slow Motion". This would prove to be the only time Foxx would tour with a full band, and features Robin Simon on guitar. The Omnidelic Exotour comprises new live studio recordings of old Foxx classics, brought up-to-date with the help of Louis Gordon. The tracks range from Foxx-era Ultravox!, to 1997’s Shifting City. All the tracks have been given a makeover and sound all the better for it, proving just how timeless Foxx's song writing really is. Standout tracks include "Overpass/This City", "The Quiet Men", “Dislocation” and the epic "Shifting City". The Subterranean Omnidelic Exotour EP was originally recorded in 1997 and made available exclusively for Foxx’s first solo tour with Louis Gordon (his first tour since 1983). The EP proved to be so popular that it was expanded and reissued the following year for more live dates, and ultimately made permanently available on this double album. A live recording of the 1998 Subterranean Omnidelic Exotour was released in 2007 under the name of Retro Future.